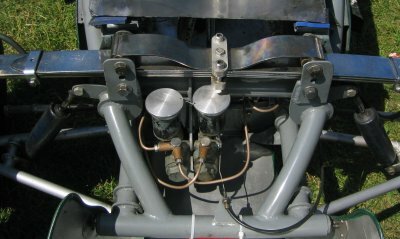 The Mk VIII was introduced for 1954 and drew on a number of lessons learned from the Beart Cooper such as the return to a single, centrally mounted, (8 gallon) fuel tank placed above the drivers knees which reduced the frontal area of the car significantly compared to the pannier tanked Mk VI and Mk VII. 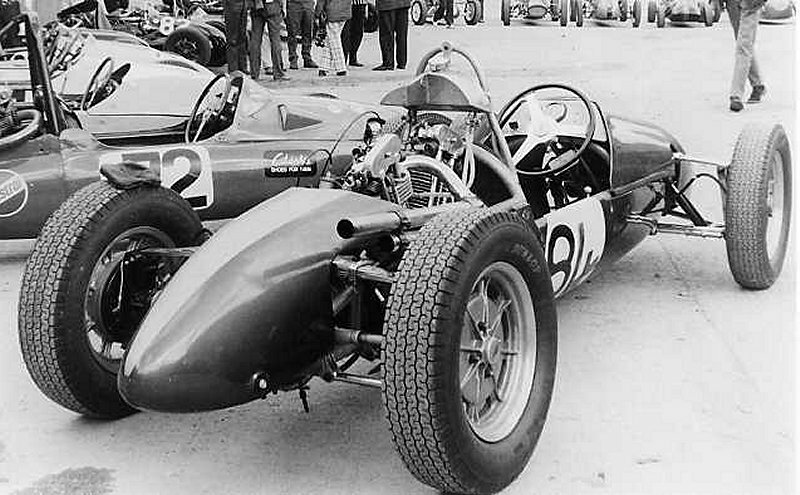 The biggest change was to the chassis which was significantly different from all previous cars and featured curved chassis tubes, not only the short lateral and vertical tubes and hoops were curved but the four main longerons too. The idea is credited to Owen Maddock but Charles Cooper played a part. The story goes that Owen sketched out a number of new designs, each of which was rejected by Charlie. In frustration, he simply bent the tubes so that everything fitted and Charlie finally approved. While not strictly good practice, this solution worked well, giving a small, light chassis which matched the shape of the body and removed the need for additional supports. It cleared important mechanical parts and allowed simple welded joints to be used which were easier to make and stronger. It is an excellent example of practical engineering where small disadvantages are far outweighed by the advantages and was adopted across the Cooper range to great effect. The Mk VII at its launch. Works drivers, Stuart Lewis-Evans and Les Leston with Charlie and John Cooper appear to be interested in some cockpit detail. Note the enclosed bodywork above the engine which was quickly removed to improve cooling and access. Photo courtesy Rick Michaud. Detail of the Mk VIII front "anti roll" spring. Owen also devised a simple but highly effective "anti roll" spring in the form of a curled leaf which sat in the middle of the main spring which in turn was mounted on two pairs of rollers set on each side of the chassis. The curled leaf is attached to the upper roller on each side and to the centre of the main spring. This prevents the main spring from moving laterally but allows some vertical movement and exploits the anti-roll effect of transverse leaf springs. As one side of the main spring is forced up, when the car rolls, so the curved leaf acts against the centre. The overall effect was a small degree of understeer and better stability in faster corners. Previous Cooper 500s had concentrated all the main masses as close to the middle of the car as possible but they became concerned that the very low polar moment of inertia was allowing the cars to "let go" suddenly on the limit of adhesion. For the Mk VIII a deliberate effort was made to move some of the mass to the ends of the car in order to promote greater stability. As well as moving the fuel tank forward, the oil tank was moved back to the extreme rear of the car. 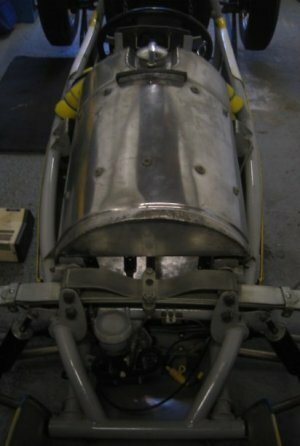 Rear view showing re-sited oil tank and curved chassis tubes. Stuart Lewis-Evans fettles. Fuel tank, curved chassis tubes and front transverse leaf spring with curled leaf. A revised (AC) fuel pump was introduced, again driven off a cam on the axle and the gearbox mounting was revised. Wheelbase was 7 ft 3 inches, front track 3 ft 10 inches and rear track 3 ft 71/2 inches. A saving in weight of about 20 lbs was achieved. 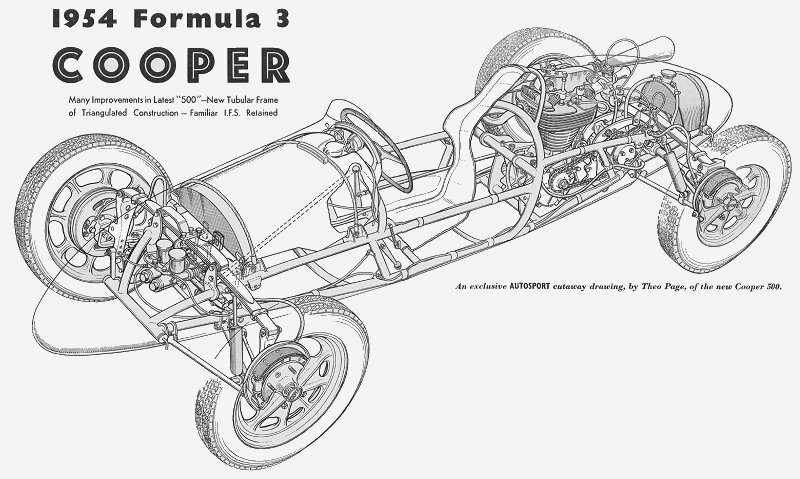 These changes enabled the body to be tidied up into the classic "torpedo" shape and lowered. Body panels were in three sections, an under tray attached directly to the chassis by Dzus fasteners, nose and tails sections which hinged to give easy access. As was usual, two versions were offered for 500cc (T31) and long chassis (T32) for V twin 1,000 and 1,100cc engines. JAP and Norton 500cc engines were available but, by this time, the Norton "double knocker" was essential if wins were to be achieved. The Mk VIII proved a significant step forward with Cooper now dominating grids numerically at home and on the continent. The works team cars were driven by Les Leston and Stuart Lewis-Evans with Moss driving when available. The Ecurie Richmond cars were driven by Eric Brandon and Rod Nuckey. Ivor Bueb and Jim Russell also bought Mk VIIIs which they used to great effect. Ivor's car had a considerable amount of weight (20lbs) removed by drilling to compensate for his healthy appetite. 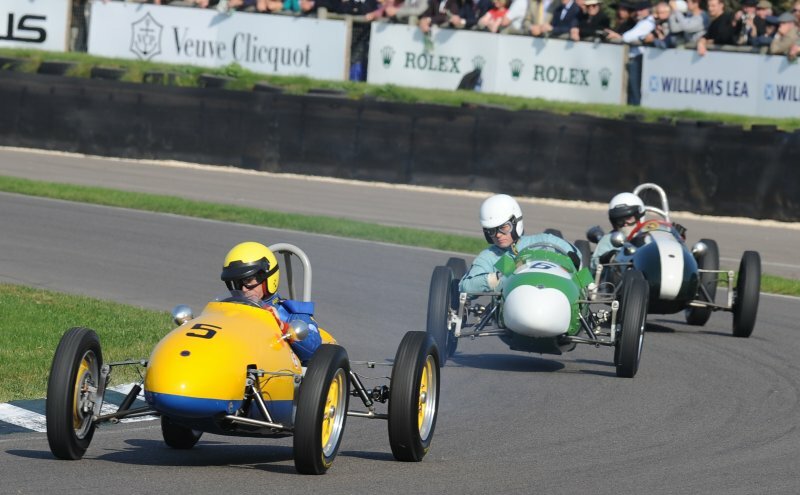 Les Leston became Formula 3 Champion in 1954, though Cooper still faced a strong challenge from the Kieft of Don Parker who finished second and could occasionally be beaten by Francis Beart's Mk VIIa. 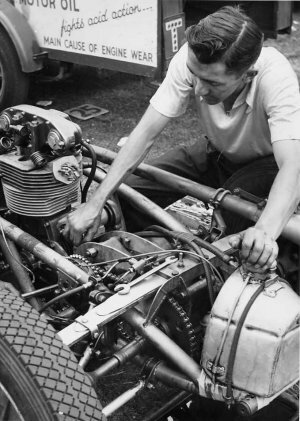 Norton engines were a necessity if outright wins were to be achieved but a young Henry Taylor used a JAP powered car though 1955 to take the Autosport Trophy for JAP engined cars and a number of overall podiums. Three Mk VIIIs battle it out at the Goodwood Revival, September 2008. Neil Hodges leads in the Alvar Strandberg car followed by James Holland in the Henry Taylor/Bob Gerard Car and Nigel Challis. A Mk VIII (T32) with JAP V Twin at Gurston Down, courtesy of Ian Frost. An article by John Bolster which was published in Autosport, January 1954. 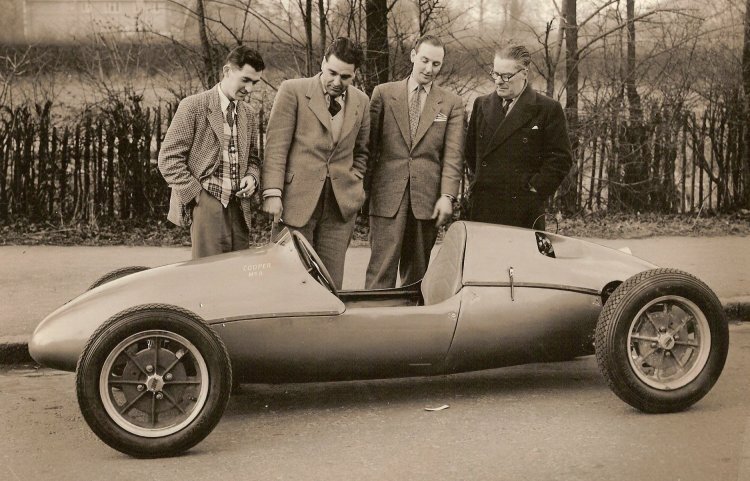 The Mk VIII also provided the basis of Cooper's second successful record attempt at Montlhéry in October 1953 when John himself set 14 new records for 350, 500 and 750cc in the streamlined car (T28). 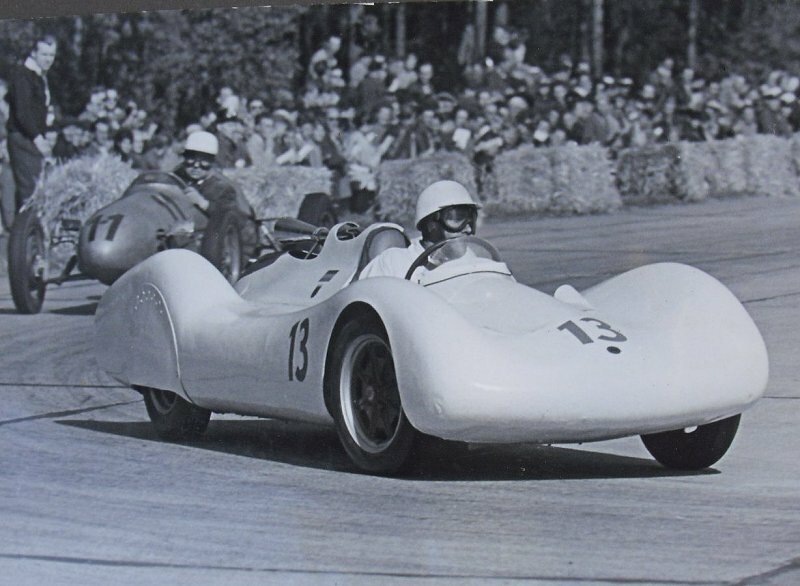 Philip Meub raced the car in Germany during 1958 before it went to the US. The Mk VIII streamliner now owned by Pete Lovely. Photo courtesy Rick Michaud. © 2019, 500 Owners Association. All rights reserved.